Starting with the blessTags version 11.2.6.0 a new panel, used to configure the blessTags application, was introduced – see the below figure. This configuration panel is active only in the full version of the blessTags application. The first option allows to run an instance or many instances (the number of instances it is not limited) of the blessTags application. In this mode, an instance of the blessTags application can manage one type of SensorTag (e.g. 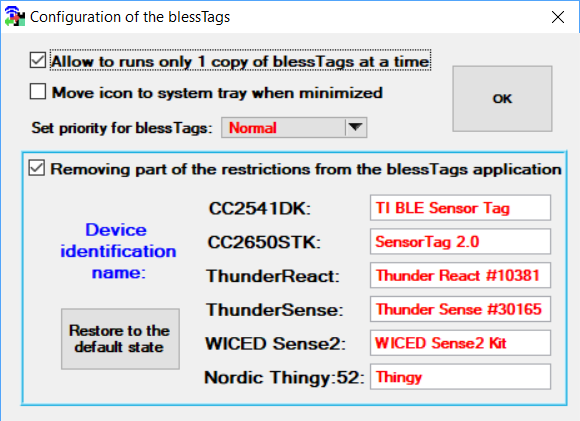 CC2650STK) and another instance of the blessTags application can manage another SensorTags (e.g. ThunderBoard Sense). The blessTags Lite application allows only one instance of the application to run at one time moment. 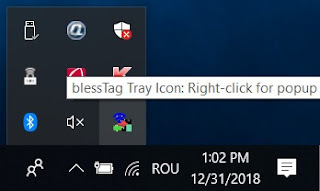 Right now, the application has the possibility to be represented by a button on the taskbar or by a small icon on the system tray. Left clicking on this icon will minimize – maximize the blessTags application. By right clicking on this icon three different controls are accessible to the user in order to: close the blessTags application, configure the active SensorTag (the last SensorTag selected by the user) and disconnect the SensorTag (all the sensors embedded on the SensorTag will be configured in sleep mode and the Bluetooth LE communication will be terminated). A short demonstration movie with these two configuration options is presented below. This option is implemented from the blessTags version 12.0.0.0, only in the full version of the application. From the configuration menu, a priority level for the application can be selected. Five different priorities are allowed (from fastest to slowest): Realtime - highest priority, High, Above normal, Normal (the program priority by default) and Below normal. In Windows, each thread is scheduled to run based on its scheduling priority. By default, in the Windows operating system (OS), all the threads have the same priority – Normal priority. The schedule of the OS assigns time slices to all the threads, in a round-robin fashion, starting with the threads with the highest priority. If none of these threads are ready to run, the system assigns time slices in the same mode (round-robin fashion) to all threads with the next highest priority. Every time when a higher-priority thread becomes available to run, the system ceases to execute the lower-priority thread and assigns a full-time slice to the higher-priority thread. This option can be used mainly to improve the speed of the data acquisition, especially when we use a faster SensorTags like Nordic Thingy:52 (with a movement data acquisition up to 200 Hz) or a modified software version for the CC2650STK. In order to work correctly, the blessTags application imposes several restrictions. For example, the identification of different types of SensorTags can be done using the mandatory BLE service Generic Access, based on the 0x2A00 characteristic. This embedded characteristic, the Device Name (0x2A00 characteristic), have a special string that defines in a unique way different SensorTags. Using this last option, the user can use custom names from each SensorTags. Additionally, other restrictions are also eliminated. For example, in order to be able to use a modified software version of the CC2650STK SensorTag (that acquires the acceleration at a higher speed – less than 150 [ms] for each sample), this option must be selected.